(M) Mens Vintage 70s Short Sleeved Disco Shirt! White, Dark Gray Speckles & Orange Circles! 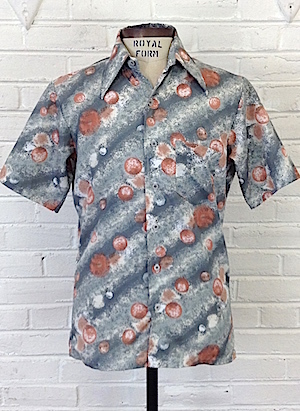 Home > Items just added 4/3-4/17 > (M) Mens Vintage 70s Short Sleeved Disco Shirt! White, Dark Gray Speckles & Orange Circles! 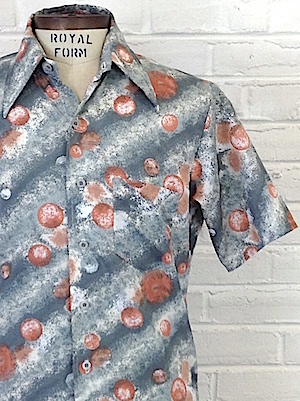 Mens vintage 1970s disco short sleeved shirt! Groovy White with dark gray speckles and burnt orange circles. Has a super wide & super pointy disco era collar. Closes in the front with gray buttons. Shirt has a one chest pocket and a straight hem. Tagged by Sears. No material tag, but feels like polyester.